William Shakespeare wrote “beware the ides of March” in his play Julius Caesar. A soothsayer warns Caesar to beware the Ides, two acts later Caesar is assassinated. In the play and reality, Julius Caesar was assassinated on the Ides of March, March 15 in the year 44 BC. Ides derives from a Latin word, meaning “to divide”. In the ancient Roman calendar every month had an ides. In March, May, July and October Ides fell on the 15th, the 13th of every other month marked the Ides. Ancient Rome meant for Ides to mark full moons within calendar months, a concept which soon ran afoul of unapologetic differences in lengths of calendar and lunar months. In Rome the Ides of March resembled our modem day deadline to file income tax, Romans considered March 15 a annual deadline for settling debt. By penning caution to Caesar in the play Julius Caesar, Shakespeare immortalized the Ides of March 15. 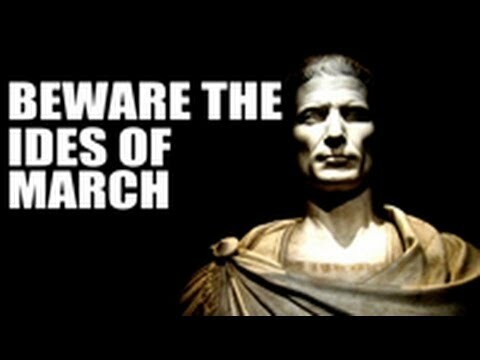 Fear not, Julius Caesar’s coincidental demise on the Ides of March is nothing more than a historical footnote. Superstition has nothing to worry about.